Kodak EasyShare C533 is a 5MP digital camera that features 5.0-megapixel resolution CCD, 3x optical zoom, 5x digital zoom, multizone autofocus, 1.8-inch LCD display, 13 programmed scenes, 3 color modes, powered by 2 AA-size batteries, ability of in-camera picture-enhancing features include cropping, auto picture rotation, and undo-delete, capture motion with continuous VGA video (640 x 480) with audio, and uses SD memory cards. TopTechNews (link dead) reviews Kodak EasyShare C533 and concludes with rating of 4.5 out of 5 that Kodak EasyShare C533 digital camera gives the newcomer and the casual photographer alike a reliable point-and-shoot tool for taking pictures. If fancy aperture settings, mind-numbing options, and confusing user guides are a turnoff, check out this great no-frills solution. Steve’s DigiCams concludes that Kodak’s EasyShare C533 is yet another appealing digicam in the entry-level consumer class. Offering average image quality, good performance, and plenty of helpful exposure modes, the C533 will make a great choice for anyone looking for an affordable alternative to disposable 35mm film cameras. With an MSRP of about $179, it offers great “bag for your buck” for a 5-megapixel model. 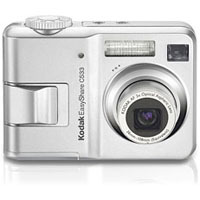 Details of features, specifications and sample photos at Kodak EasyShare C533 Zoom official home page (no longer available).